Smart Video&Audio Converter Lite | Mac App Storeのアプリ検索・ランキング BuzzMac! 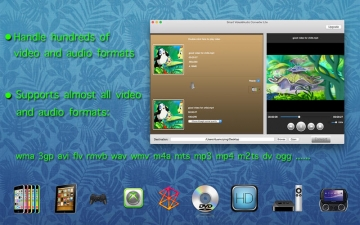 Smart Video&Audio Converter Lite supports convert videos and audios for Apple TV, iPad, iPhone, iPod, XBox 360, PlayStation 3, PSP, PS3, Pocket PC, Zune, Audio CD discs, DVD discs, Blu-ray discs, moblie phone: Blackberry, Samsung, and many others. 1.Support highly compatible HDV, DV video formats: *.mod, *.tod, *.m2ts, *.evo, *.vro, *.mts, etc. iPad, iPhone, iPod, XBox 360, PSP, PS3, Pocket PC, Zune, Audio CD discs, DVD discs, Blu-ray discs, HDV, DV, PS Vita, Blackberry, Samsung, Android, Nokia, etc. 3GP, 3GP2, 3G2, 3GPP, AVI, ASF, AIFF, AIF, APE, CAF, CDA, DAT, DSM, DV, DTS, FLI, FLC, F4V, GIF, IFO, MP4, MPG, MPEG, M1V, MOD, M2TS, MTS, M4V, MXF, MKV, OGV, OGM, QT, RMVB, RM, RA, RAM, TOD, TS, WMV, WEBM. MOV, FLV, WAV, WMA, MP2, MP3, AAC, M4A, FLAC, AMR, OGG, MMF, AC3, AU. OGG, WebM, WMV, MKV, AVI, DivX, XviD, MPEG, MP4, MOV, QT, RM, RMVB, FLV, MPEG2 TS, ASF, 3GP, 3GP2, GIF, SWF, H.264/MPEG-4 AVC, H.264/PSP AVC Video, H.264 TS, WMV-HD, MKV-HD, Divx-HD, DivX-HD, MOV-HD, FLV-HD, MP4-HD. MOV, FLV, WAV, WMA, MP2, MP3, AAC, M4A, FLAC, AMR, OGG, MMF, AWB, AC3, AU.